That deep frying sound network TV executives hear over their shoulders is coming from the kitchen – Emeril Lagasse’s kitchen. Lagasse has transformed “The Essence of Emeril,” a spirited little 30-minute cooking show on the Food Network and amped it up a thousand degrees into “EMERIL LIVE,” an hour-long explosion of food, laughs and good times. Not many cable TV shows cause ABC, CBS and NBC prime-time schedulers to sweat. But outside of maybe “ER,” “Homicide” and “NYPD Blue,” there isn’t anything more fun to watch at 10 p.m. than Lagasse cooking and cutting up. Just look out for the powdered sugar as he launches it on the run from one end of his TV kitchen to the other. Wait – did you miss that the first time? Essential Emeril: Favorite Recipes and Hard-Won Wisdom From My Life in the Kitchen by Emeril Lagasse. Order now by clicking on the book cover above! Rules? The problem with cooking is too many rules. The audience for “Emeril Live” sits in an ideal configuration for this type of show, some on bleachers, some at round, cafe-style tables, still others right at his cooking counter, close enough to savor Lagasse’s creations first-hand. Lagasse, 39, owns two restaurants in New Orleans (Emeril’s and NOLA), a third in Las Vegas (Emeril’s New Orleans Fishhouse), has authored two cookbooks (“Emeril’s New New Orleans Cooking” and “Louisiana Real & Rustic,” both published by William Morrow) and employs 350 people overall. The entrepreneurial chef was discovered three years ago by former Food Network President Reese Schonfeld. Schonfeld saw Lagasse performing his magic at the Emeril’s Restaurant display kitchen in New Orleans. 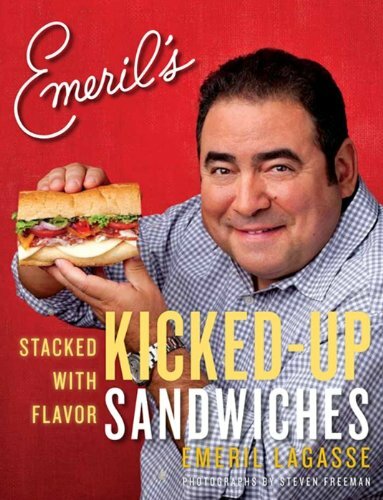 Very little in Emeril’s act has changed since then, except that he looks up at the camera while cooking now instead of down at his food. And he works at keeping his TV recipes simple. Where does he get all that enthusiasm? Beside the espresso machine in his dressing room, Lagasse – who has no stage training – says restaurant cooking should always be entertaining. “If I don’t think the staff of my restaurant is pumped up enough to go ‘on stage,'” he says, “I’ve been known to sometimes take the whole staff jogging around the block before we open to get everyone psyched. From Emeril’s Kitchens: Favorite Recipes from Emeril’s Restaurants. Order now by clicking on the book cover above! Certainly the crowd went wild when he tells them he’d make enough beignets for everyone. Actually, “Emeril Live” may be more like the old Arsenio Hall show – all Lagasse needs now is a trademark move like Hall pumping his fist in the air. Maybe he could spin a jar of his own seasoning – “Essence of Emeril,” natch – on the edge of his index finger. All kidding aside, the only thing Lagasse really needs to do is be truly live. Because despite the show’s title, “Emeril Live” isn’t. Surprised? So was Mr. Media. That will probably surprise anyone who has ever seen the show or promos for it, which certainly give the impression it’s live, as in “happening right now.” But it’s not. He tapes “Live” in three-a-day bursts, much as he recorded up to seven “Essence of Emeril” programs a day for the last two and a half years. Will the show ever live up to its “Live” name?